Magento is an all-in-one distance selling platform, a Content Management System (CMS). Created in 2008, it currently equips hundreds of thousands of e-commerce sites around the world. The qualities of this platform are matched only by its technical nature, which requires the support of a team of developers and specialized integrators. With its Magento certifications, the Mega web agency offers you its technical expertise and the dedication of its team, with one goal: the success of your e-commerce project. The use of a CMS for an e-commerce site is an interesting solution on paper compared to the development of a “home” tool, because the software that exists on the market is generally well thought out in “all-in” mode. -In-one”: catalog management, customers, orders, but also online marketing, SEO, etc. Magento is obviously not the only tool on the market, and as a business leader or e-commerce site manager you need to ask yourself the following question: why should I opt for Magento? Is the Magento e-commerce platform the best on the market? Is it the guarantor of the success of your project or the development of your online turnover? To these questions, there is no miracle answer that can be given without a study of your project by our team of experts. Indeed, Mega Web Design is made up of experienced developers and integrators who have met many successful projects: we know the strengths and weaknesses of Magneto, and the study of your project, your objectives, even of your existing e-commerce site, we will tell you whether or not Magento can help you to develop on the net in the field of online commerce. With Magento’s multi-address shipping functionality, the customer experience on your site is greatly enhanced. It offers extensive catalog management and pricing rules, allowing e-merchants to create a wide range of promotions from store-wide promotions to highly targeted discount coupons. Why Do Business With Our Team? 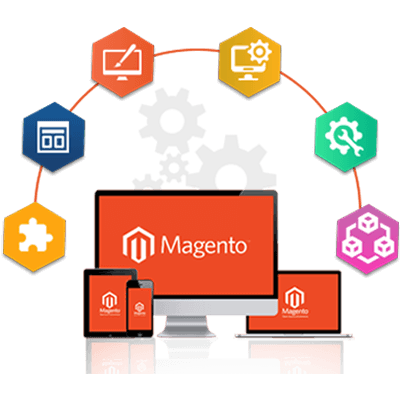 Our years of experience as Magento development services have allowed us to work with many extensions enriching the platform to better meet different specific needs: optimize performance, connect to APIs, improve the user experience, integrate marketing tools, etc. With the vast amount of modules available on the Magento Marketplace, we can modify your site to align with your vision. If nothing exists to accommodate you, we will develop the extension needed to make your site a completely personalized solution. The configuration and its developments are made according to the pragmatic logic and the evolutionary use of the platform. Why Choose Us For Magento Development? Our working methods are based on the same ones as the developers of the solution for better integration. We can realize your project from A to Z. From the installation of the Magento software on your server, through the configuration of the product catalog, the integration of your carrier for the calculation of the cost of transport, the link of your shop Online with your merchant account processor to collect payments and any other customizations and automation imaginable. Being exclusively a specialized Magento development company in India, this allows us to better understand the diversity of the needs of a company, whether in terms of programming, management, marketing, and design.